Alterations in the Wnt/β-catenin pathway are associated with the development and progression of human prostate cancer. Decursin, a pyranocoumarin isolated from the Korean Angelica gigas root, inhibits the growth of androgen-independent human prostate cancer cells, but little is known about its mechanism of action. Using a cell-based screen, we found that decursin attenuates the Wnt/β-catenin pathway. 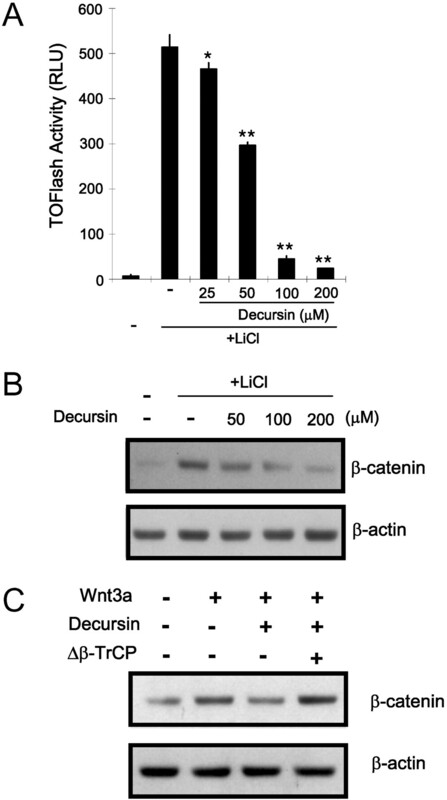 Decursin antagonized β-catenin response transcription (CRT), which was induced with Wnt3a-conditioned medium and LiCl, by promoting the degradation of β-catenin. Furthermore, decursin suppressed the expression of cyclin D1 and c-myc, which are downstream target genes of β-catenin and thus inhibited the growth of PC3 prostate cancer cells. In contrast, decursinol, in which the (CH3)2–C=CH–COO–side chain of decursin is replaced with–OH, had no effect on CRT, the level of intracellular β-catenin, or PC3 cell proliferation. Our findings suggest that decursin exerts its anticancer activity in prostate cancer cells via inhibition of the Wnt/β-catenin pathway. Wnts, cysteine-rich secreted glycoproteins, play important roles in cell proliferation, fate determination, and movement during development (Wodarz and Nusse, 1998; Polakis, 2000). Depending on the type of Wnt and the Frizzled (Fz) receptor it engages, one of three intracellular signaling pathways may be activated: the Wnt/β-catenin pathway, the planar cell polarity pathway, and the Wnt/Ca2+ pathway (Kühl et al., 2000; Winklbauer et al., 2001; Giles et al., 2003). Among these, the best understood is the Wnt/β-catenin pathway, which is activated by the interaction of Wnt1, Wnt3a, and Wnt8 with Fz receptors and low-density lipoprotein receptor-related protein 5/6 coreceptors (Giles et al., 2003). The pathway is regulated mainly by the level of cytosolic β-catenin, which activates several genes. In the absence of a Wnt signal, casein kinase 1 and glycogen synthase kinase-3β (GSK-3β), which form a complex with adenomatous polyposis coli (APC)/Axin, sequentially phosphorylate β-catenin at Ser33, Ser37, Thr41, and Ser45 (Liu et al., 2002). Phosphorylated β-catenin is then recognized by F-box β-transducin repeat-containing protein (β-TrCP), a component of the ubiquitin ligase complex, resulting in the degradation of β-catenin (Latres et al., 1999). Activation of the receptor by its Wnt ligands negatively regulates GSK-3β, leading to the accumulation of cytoplasmic β-catenin (Lee et al., 2003a). Prostate cancer is one of the most frequently diagnosed cancers and the second leading cause of cancer-related death in men (Jemal et al., 2005). Dysfunction in the Wnt/β-catenin pathway is a frequent event during prostatic tumorigenesis (Barker and Clevers, 2000). For example, alterations in the APC gene, including somatic mutation and promoter hypermethylation, are frequently observed in prostate cancers, as are mutations in the β-catenin gene (Chesire et al., 2000; Gerstein et al., 2002). Indeed, the intracellular level of β-catenin is significantly elevated in more than 20% of advanced prostate tumors, 77% of prostatic lymph node metastases, and 85% of prostatic bone metastases (Chesire and Issac, 2002). β-Catenin is translocated into the nucleus, where it complexes with T-cell factor (TCF)/lymphocyte enhancer factor family transcription factors to activate the expression of Wnt/β-catenin-responsive genes, such as c-myc, cyclin D1, and metalloproteinase-7, which play important roles in tumorigenesis and metastasis (He et al., 1998; Tetsu and McCormick, 1999; Takahashi et al., 2002). Thus, decrease of abnormally up-regulated intracellular β-catenin is a potential therapeutic strategy for chemoprevention and treatment of prostate cancer. Decursin is a pyranocoumarin found in the roots of Angelica gigas Nakai, which has been traditionally used to treat anemia and other diseases (Chi and Kim, 1970). Decursin has a cytotoxic effect on leukemia cells through a mechanism involving protein kinase C and reactive oxygen species, and it has antitumor activity in mice inoculated with sarcoma cells (Lee et al., 2003b; Kim et al., 2005). It has been reported that decursin suppresses growth and promotes apoptosis in human prostate carcinoma cells (Yim et al., 2005; Jiang et al., 2006). Moreover, the (CH3)2–C=CH–COO–side chain of decursin, which is replaced with an OH group in decursinol, seems to be necessary for its anticancer activity (Yim et al., 2005; Guo et al., 2007). In the present study, we identified decursin as an inhibitor of the Wnt/β-catenin pathway using cell-based small-molecule screening. Decursin may inhibit the growth of prostate cancer cells by promoting the degradation of intracellular β-catenin. Preparation of Decursin and Decursinol. (+)-Decursinol was prepared from the roots of A. gigas as described previously (Lee et al., 2006). For the synthesis of decursin, decursinol was added to a solution of 3,3-dimethylacrylic acid, dicyclohexylcarbodiimide, and 4-dimethylaminopyridine with 350 ml of dry methylene chloride. The reaction mixture was stirred at room temperature for 24 h and filtered. The filtrate was evaporated under low pressure and purified by flash chromatography (n-hexane/ethyl acetate = 10:1 to 1:1) to yield (+)-decursin as a white powder. The structures of (+)-decursinol and (+)-decursin were confirmed by comparing NMR and mass spectrometry spectra, as reported previously (Lim et al., 2001). Cell Culture, Transfection, and Luciferase Assay. HEK293, PC-3, and Wnt3a-secreting L cells were obtained from American Type Culture Collection (Manassas, VA) and maintained in Dulbecco's modified Eagle's medium supplemented with 10% fetal bovine serum, 120 μg/ml penicillin, and 200 μg/ml streptomycin. Wnt3a-conditioned medium (Wnt3a CM) was prepared as described previously (Gwak et al., 2006). In brief, Wnt3a-secreting L cells were cultured in Dulbecco's modified Eagle's medium with 10% fetal bovine serum for 4 days. The medium was harvested and sterilized using a 0.22-μm filter. Fresh medium was added, the cells were cultured for another 3 days, and the medium was collected and combined with the previous medium. Transfection was performed with Lipofectamine 2000 (Invitrogen, Carlsbad, CA) according to the manufacturer's instructions. The luciferase assay was performed using a Dual Luciferase Assay kit (Promega, Madison, WI). Plasmid Constructs. Human Frizzled-1 cDNA was cloned as described previously (Cho et al., 2005). Reporter plasmids containing the cyclin D1 promoters were prepared by amplifying the promoter regions, which harbored TCF-4 response elements, by polymerase chain reaction and insertion into pRL-null vectors, yielding pCyclinD1-RL. The pTOPFlash and pFOPFlash reporter plasmids were obtained from Upstate Biotechnology (Lake Placid, NY). The dominant-negative β-TrCP (Δβ-TrCP) expression plasmid was a gift from M. Davis (Hebrew University-Hadassah Medical School, Jerusalem, Israel). pCMV-RL and pSV-FL plasmids were purchased from Promega. Screening for a Small-Molecule Inhibitor of Wnt/β-Catenin Signaling. The HEK293 reporter and control cell line was established as described previously (Park et al., 2006). The cells were inoculated into 96-well plates at 15,000 cells/well in duplicate and grown for 24 h. Wnt3a CM was added, and then chemicals including coumarins, flavonoids, naphthoquinones, and terpenoids were added to the wells at a final concentration of 30 μg/ml. After 15 h, the plates were assayed for firefly luciferase activity and cell viability. Western Blotting. The cytosolic fraction was prepared as described previously (Dignam et al., 1983). Proteins were separated by SDS-polyacrylamide gel electrophoresis in a 4 to 12% gradient gel (Invitrogen) and transferred to nitrocellulose membranes (Bio-Rad Laboratories, Hercules, CA). The membranes were blocked with 5% nonfat milk and probed with anti-β-catenin (BD Transduction Laboratories, Lexington, KY), anti-cyclin D1 (Santa Cruz Biotechnology, Santa Cruz, CA), anti-myc (Santa Cruz Biotechnology), and anti-actin antibodies (Cell Signaling Technology, Danvers, MA). The membranes were then incubated with horseradish-peroxidase-conjugated anti-mouse IgG or anti-rabbit IgG (Santa Cruz Biotechnology) and visualized using the enhanced chemiluminescence system (Santa Cruz Biotechnology). RNA Extraction and Semiquantitative RT-PCR. Total RNA was isolated with TRIzol reagent (Invitrogen) in accordance with the manufacturer's instructions. cDNA synthesis, reverse transcription, and polymerase chain reaction were performed as described previously (Park et al., 2006). The amplified DNA was separated on 2% agarose gels and stained with ethidium bromide. Cell Viability Assay. Cells were inoculated into 96-well plates and treated with decursin for 48 h. The cell viability from each treated sample was measured in triplicate using CellTiter-Glo assay kit (Promega) according to the manufacturer's instructions. Identification of Decursin as an Inhibitor of the Wnt/β-Catenin Pathway. To identify cell-permeable small molecules capable of inhibiting the Wnt/β-catenin pathway, we used a cell-based screening system. HEK293 reporter cells that are stably transfected with TOPFlash, a synthetic β-catenin/Tcf-dependent luciferase reporter, and human Frizzled-1 expression plasmids were dispensed into a 96-well plate. After the addition of Wnt3a CM and each compound, we monitored TOPFlash reporter activity using a microplate reader (Fig. 1A). One of the compounds identified from this screen was decursin (Fig. 1B). As shown in Fig. 1C, decursin produced a dose-dependent decrease in Wnt3a CM-induced β-catenin response transcription (CRT); approximately 80% of CRT was blocked at a concentration of 200 μM decursin. In contrast, activity of FOPFlash, a negative control reporter with mutated β-catenin/Tcf binding elements, was not altered by incubation with decursin and Wnt3a CM (Fig. 1C). Under these conditions, no cytotoxic effects of decursin were observed (data not shown). These results suggest that decursin specifically inhibits the Wnt/β-catenin pathway. Decursin Promoted Proteasome-Mediated β-Catenin Degradation. In the Wnt/β-catenin pathway, CRT is largely controlled by the level of intracellular β-catenin, which regulates the expression of several target genes. To determine whether decursin affects the intracellular level of β-catenin, we used Western blot analysis with anti-β-catenin antibody to determine the amount of cytosolic β-catenin in decursin-treated HEK293 reporter cells. As shown in Fig. 2A, incubation with decursin resulted in down-regulation of the β-catenin that had accumulated in the presence of Wnt3a. We next examined whether decursin reduces the mRNA expression of β-catenin in HEK293 reporter cells using semiquantitative RT-PCR. In contrast to the protein level of β-catenin, mRNA expression of β-catenin was unchanged by any of the concentrations of decursin used, suggesting that decursin inhibits Wnt/β-catenin signaling by reducing β-catenin protein level without affecting β-catenin mRNA expression (Fig. 2B). It was demonstrated previously that the intracellular level of β-catenin is regulated by ubiquitin-dependent proteolysis (Aberle et al., 1997). To explore whether the decursin-induced down-regulation of β-catenin is mediated by the proteasome, we used MG-132 to inhibit proteasome-mediated protein degradation. Decursin induced a consistent decrease in the level of β-catenin in HEK293 reporter cells (Fig. 2C); however, the effect of decursin was nullified by the addition of MG-132 (Fig. 2C). Taken together, these results indicate that decursin inhibits the Wnt/β-catenin pathway via proteasome-mediated degradation of β-catenin. Identification of decursin as a small-molecule inhibitor of Wnt/β-catenin pathway. A, screening of compounds that inhibit Wnt/β-catenin pathway. Compounds modulating TOPFlash reporter activity were screened using the HEK293 reporter cells. The controls were assayed in the presence or absence of Wnt3a CM. B, chemical structure of decursin. C, dose-dependent inhibition of CRT. HEK293 reporter and control cells were incubated with indicated concentrations of decursin in the presence of Wnt3a CM. After 15 h, luciferase activity was determined. TOPFlash activity is reported as relative light unit (RLU) normalized to CellTiter-Glo (Promega) activity. The results are the average of three experiments, and the bars indicate standard deviations. *, P < 0.05, and **, P < 0.01, compared with the vehicle control group. β-TrCP but Not GSK-3β Was Necessary for Decursin-Mediated Degradation of β-Catenin. Because the phosphorylation of β-catenin by GSK-3β and its subsequent association with β-TrCP leads to β-catenin degradation (Winston et al., 1999), we examined whether decursin-mediated inhibition of the Wnt/β-catenin pathway requires GSK-3β activity. To this end, HEK293 reporter cells were incubated with LiCl, an inhibitor of GSK-3β (Klein and Melton, 1996), resulting in increased CRT (Fig. 3A). It is interesting that decursin suppressed LiCl-induced CRT (Fig. 3A). Furthermore, Western blot analysis showed that decursin reduced the amount of β-catenin induced by LiCl (Fig. 3B), indicating that decursin-mediated inhibition of the Wnt/β-catenin pathway is independent of GSK-3β. We also tested whether β-TrCP is required for decursin-induced degradation of β-catenin. As shown in Fig. 3C, ectopic expression of a dominant-negative form of β-TrCP (Δβ-TrCP), which interacts with phosphorylated β-catenin but is unable to form a SCFβ-TrCP ubiquitin ligase complex (Hart et al., 1999), abolished the decursin-mediated degradation of β-catenin. These results suggest that decursin promotes the degradation of β-catenin via a β-TrCP-dependent mechanism. Decursin promotes the degradation of β-catenin via a proteasome. A, cytosolic proteins were prepared from HEK293 reporter cells treated with either vehicle (DMSO) or indicated concentrations of decursin in the presence of Wnt3a CM for 15 h and then subjected to Western blotting with β-catenin antibody. B, semiquantitative RT-PCR for β-catenin, and glyceraldehydes-3-phosphate dehydrogenase was performed with total RNA prepared from HEK293 reporter cells either vehicle (DMSO) or indicated concentrations of decursin in the presence of Wnt3a CM for 15 h. C, cytosolic proteins prepared from HEK293 reporter cells, which were incubated with vehicle (DMSO) or decursin (100 μM) in the presence or absence of Wnt3a CM, exposed to MG-132 (20 μM) for 8 h, were subjected to Western blotting with anti-β-catenin antibody. In A and C, to confirm equal loading, the blot was reprobed with anti-actin antibody. Decursin Attenuated the Wnt/β-Catenin Pathway in Prostate Cancer Cells. Because decursin was identified recently as a chemopreventive agent against prostate carcinoma cells (Yim et al., 2005; Jiang et al., 2006), we tested whether decursin also suppresses the Wnt/β-catenin pathway in prostate cancer cells, which frequently show abnormally high levels of intracellular β-catenin (Barker and Clevers, 2000). Androgen-independent PC3 prostate cancer cells were transiently transfected with TOPFlash followed by incubation with increasing amounts of decursin. As seen in the HEK293 reporter cells, decursin repressed CRT in PC3 cells (Fig. 4A). In conjunction with this experiment, we evaluated the level of cytosolic β-catenin in decursin-treated PC3 cells. Consistent with our results in HEK293 cells, Western blot analysis showed that β-catenin was down-regulated in a concentration-dependent manner (Fig. 4B). 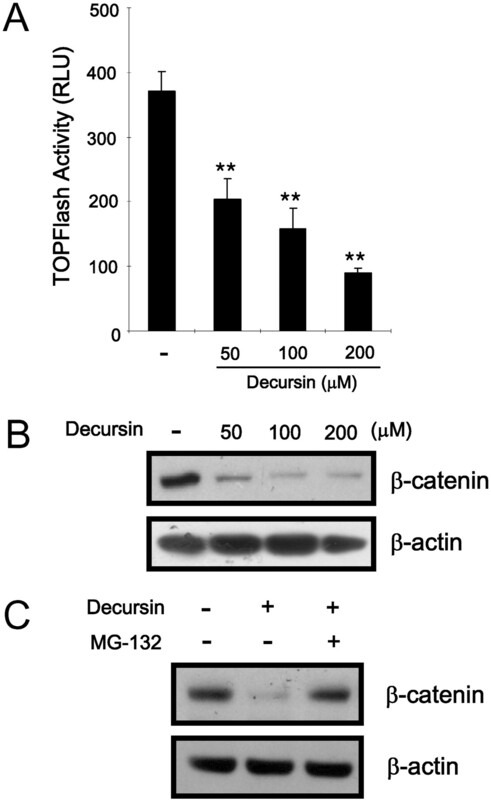 Furthermore, MG-132 abolished the decursin-induced down-regulation of β-catenin in PC3 cells (Fig. 4C). These results indicate that decursin promotes β-catenin degradation in prostate cancer cells. Decursin induces β-catenin degradation through a mechanism independent of GSK-3β and dependent of β-TrCP. A, HEK293 reporter cells were incubated with decursin in the presence of 20 mM LiCl. After 15 h, luciferase activity was determined. TOPFlash activity is reported as relative light unit (RLU) normalized to CellTiter-Glo (Promega) activity. The results are the average of three experiments, and the bars indicate standard deviations. *, P < 0.05, and **, P < 0.01, compared with the vehicle control group. B, cytosolic proteins were prepared from HEK293 reporter cells treated with either vehicle (DMSO) or increasing amounts of decursin in the presence of 20 mM LiCl for 15 h and then subjected to Western blotting with β-catenin antibody. C, HEK293 cells were transfected with the Δβ-TrCP expression plasmid and then incubated with either the vehicle (DMSO) or decursin (100 μM) in the presence of Wnt3a CM for 15 h. Cytosolic proteins were subjected to Western blotting with β-catenin antibody. In B and C, the blots were reprobed with anti-actin antibody as a loading control. Decursin Repressed the Expression of β-Catenin-Dependent Genes and Inhibited the Proliferation of Prostate Cancer Cells. We next examined whether decursin affects the expression of β-catenin-dependent genes. To this end, PC3 cells were transfected with a reporter construct containing the cyclin D1 promoter, which contains a β-catenin/TCF-4-responsive region, and then incubated with different concentrations of decursin. As shown in Fig. 5A, cyclin D1 promoter activity was repressed by decursin. We also measured the mRNA and protein expression of cyclin D1 in decursin-treated PC3 cells. Consistent with our result for the cyclin D1 promoter, a dose-dependent decrease in cyclin D1 mRNA and protein expression was observed in response to decursin (Fig. 5, B and C). In addition, the expression of c-myc, an established downstream target of β-catenin (He et al., 1998), was also significantly reduced in PC3 cells after incubation with decursin (Fig. 5D). Recently, inhibition of the Wnt/β-catenin pathway by expression of Frzb/secreted Frizzled-related protein, a secreted Wnt antagonist, suppressed the proliferation of androgen-dependent and -independent prostate cancer cells (Zi et al., 2005; Horvath et al., 2007). Moreover, cyclin D1, which forms a complex with cyclin-dependent kinase 4/6, mediates growth factor-dependent G1 phase progression (Sherr, 1996). Given that decursin inhibits the Wnt/β-catenin pathway and cyclin D1 expression, we examined whether decursin reduces PC3 cell growth. PC3 cells were incubated with varying concentrations of decursin, and cell growth was monitored. As shown in Fig. 5E, decursin efficiently suppressed PC3 cell growth in a concentration-dependent manner. Decursin promotes the degradation of β-catenin in PC3 prostate cancer cells. A, PC3 cells were cotransfected with TOPFlash and pCMV-RL plasmids and incubated with decursin for 15 h. Luciferase activities were measured 39 h after transfection. TOPFlash activity is reported as relative light unit (RLU) normalized to Renilla reniformis luciferase activity. Results are the average of three experiments, and the bars indicate standard deviations. **, P < 0.01 compared with the vehicle control group. B. cytosolic proteins were prepared from PC3 cells treated with the vehicle (DMSO) or decursin for 15 h and then subjected to Western blotting with β-catenin antibody. C, cytosolic proteins prepared from PC3 cells were incubated with vehicle (DMSO) or decursin (100 μM), exposed to MG-132 (20 μM) for 8 h, and then subjected to Western blotting with anti-β-catenin antibody. In B and C, to confirm equal loading, the blot was reprobed with anti-actin antibody. Decursinol Did Not Inhibit the Wnt/β-Catenin Pathway. Decursinol is natural analog of decursin that lacks the (CH3)2–C=CH–COO–side chain (Fig. 6A). A recent study reported that decursinol has lower anticancer activity compared with decursin, suggesting that the missing side chain may be responsible for the decursin-mediated growth inhibition of prostate cancer cells (Yim et al., 2005). To further analyze the relationship between structure and function in these compounds, we determined the effect of decursinol on the Wnt/β-catenin pathway. When HEK293 reporter cells were incubated with decursinol, no significant inhibition of Wnt3a-induced CRT was observed, in contrast to our results with decursin (Fig. 6B). Consistent with this result, decursinol did not decrease the amount of cytosolic β-catenin in HEK293 reporter cells or in PC3 cells at any of the concentrations tested (Fig. 6, C and D), suggesting that decursinol was unable to induce the degradation of β-catenin. As expected, decursinol did not repress the expression of cyclin D1 in PC3 cells (Fig. 6E), and it did not affect their growth at concentrations of 50 and 100 μM, although it decreased their growth by approximately 20% at a concentration of 200 μM (Fig. 6F). Taken together, these results indicate that the (CH3)2–C=CH–COO–side chain of decursin is crucial for inhibition of the Wnt/β-catenin pathway and the anticancer activity of the compound in PC3 cells. Decursin inhibits the expression of the β-catenin-dependent genes. A, PC3 cells were cotransfected with cyclin D1-RL and pSV40-FL and then incubated with indicated amounts of decursin for 15 h. Luciferase activities were measured 39 h after transfection. Cyclin D1 promoter activity is reported as relative light unit (RLU) normalized to firefly luciferase activity. The results are the average of three experiments, and the bars indicate standard deviations. *, P < 0.05 compared with the vehicle control group. B, semiquantitative RT-PCR for cyclin D1, and glyceraldehydes-3-phosphate dehydrogenase was performed with total RNA prepared from PC3 cells treated with the vehicle (DMSO) or decursin for 15 h. C and D, PC3 cells were incubated with the vehicle (DMSO) or decursin for 15 h, and then cell extracts were prepared for Western blotting with anti-cyclin D1 (C) and anti-myc (D) antibodies. To confirm equal loading, the blots were reprobed with anti-actin antibody. E, PC3 cells were incubated with increasing amounts of decursin, and cell viability was determined by CellTiter-Glo assay (Promega). The results shown are the average of three experiments, and the bars indicate standard deviations. *, P < 0.05, and **, P < 0.01, compared with the vehicle control group. Aberrant accumulation of intracellular β-catenin is involved in the progression of prostate cancer at an early stage, during the formation of the primary lesion and at the advanced, hormone-refractory stage (Barker and Clevers, 2000). Using a cell-based screen, we showed that decursin suppresses the Wnt/β-catenin pathway by promoting the degradation of β-catenin. The level of intracellular β-catenin is predominantly regulated by two pathways, a GSK3β-dependent pathway, and an Siah-dependent pathway. In the GSK3β-dependent pathway, the N-terminal residue of β-catenin is phosphorylated by a multiprotein complex composed of APC, Axin, and GSK-3β (Hart et al., 1998), leading to the degradation of β-catenin through a ubiquitin-dependent mechanism (Aberle et al., 1997). In the Siah-dependent pathway, Siah-1 interacts with the carboxyl terminus of APC, which recruits the ubiquitination complex and promotes the degradation of β-catenin via a GSK-3β- and β-TrCP-independent pathway (Liu et al., 2001). 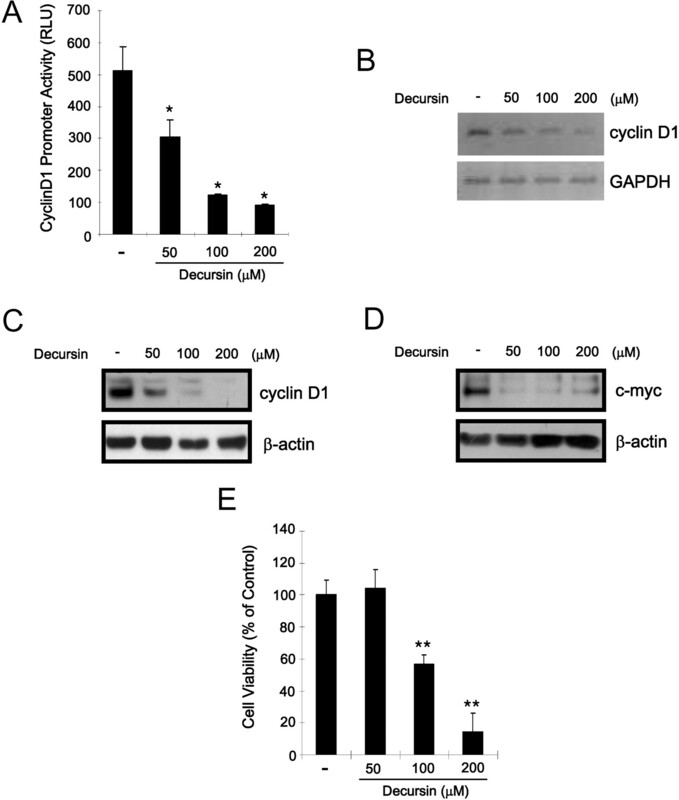 In this study, decursin was able to induce the degradation of intracellular β-catenin in the presence of Wnt3a and LiCl, which are well known GSK-3β inhibitors, suggesting that GSK3β is not necessary for decursin-mediated β-catenin degradation. In addition, overexpression of Δβ-TrCP abolished β-catenin degradation by decursin, indicating that β-TrCP is required for decursin-mediated β-catenin degradation. 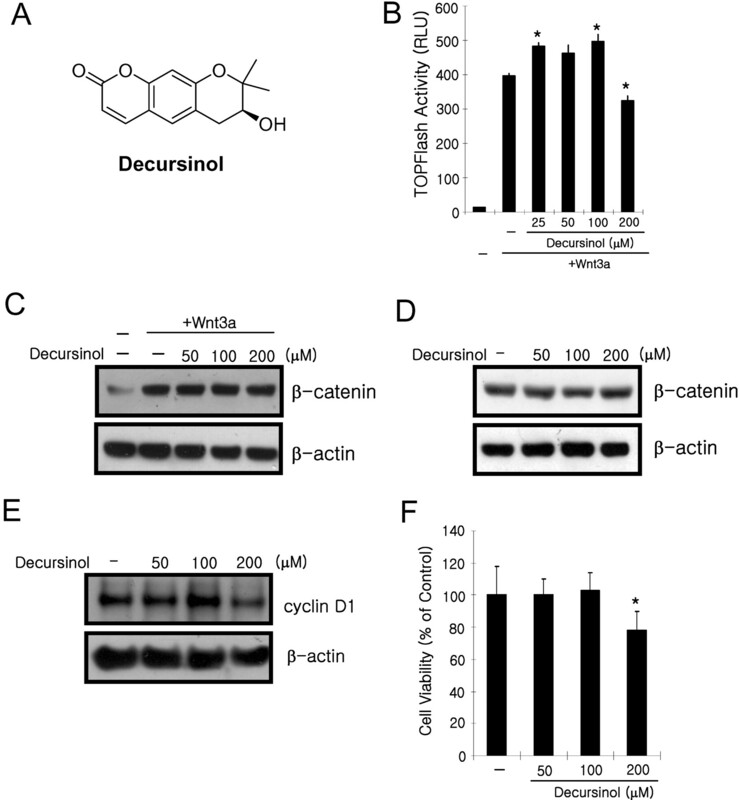 These data suggest that decursin promotes the degradation of β-catenin through a mechanism other than those described above. We plan to investigate the mechanism of decursin-induced β-catenin degradation in the future. Intracellular β-catenin promotes the development of prostate cancer thorough the β-catenin/TCF and β-catenin/androgen receptor (AR) pathways (Chesire and Issac, 2002). Activation of β-catenin/TCF pathway promotes proliferation and suppresses apoptosis in prostate cancer cells (de la Taille et al., 2003). In β-catenin/AR pathway, β-catenin interacts with AR, resulting in the up-regulation of AR activity in a ligand-dependent manner, which supports the growth of prostate cancer cells (Mulholland et al., 2003). Recently, it was shown that decursin inhibits growth and promotes cell death in both androgen-dependent and -independent prostate cancer cells (Yim et al., 2005). Jiang et al. (2006) suggested that decursin inhibits the proliferation of androgen-dependent LNCaP cells via AR inactivation, including the inhibition of androgen-stimulated nuclear translocation of AR and down-regulation of AR protein expression. Here, we observed that decursin suppressed CRT and promoted the degradation of intracellular β-catenin in androgen-independent PC3 cells. Moreover, the expression of several targets of β-catenin, including cyclin D1 and c-myc, which play important roles in tumorigenesis and cell cycle progression (Utsunomiya et al., 2001), was repressed by decursin in PC3 cells. This finding indicates that decursin inhibits cellular proliferation by suppressing the β-catenin/TCF pathway in androgen-independent cells rather than by inactivating the β-catenin/AR pathway. Consistent with this idea, recent studies have shown that inhibition of the Wnt/β-catenin pathway by expression of a Wnt antagonist, such as Frzb/secreted Frizzled-related protein-3 and a dominant-negative version of LRP5, suppresses PC3 cell growth (Zi et al., 2005; Horvath et al., 2007). Decursinol does not inhibit Wnt/β-catenin pathway. A, chemical structure of decursinol. B, HEK293 reporter cells were incubated with indicated concentrations of decursinol in the presence of Wnt3a CM. After 15 h, luciferase activity was determined. TOPFlash activity is reported as relative light unit (RLU) normalized to CellTiter-Glo (Promega) activity. The results are the average of three experiments, and the bars indicate standard deviations. *, P < 0.05 compared with the vehicle control group. C and D, cytosolic proteins were prepared from HEK293 reporter cells (C) or PC3 cells (D) treated with either vehicle (DMSO) or indicated concentrations of decursinol in the presence of Wnt3a CM (C) for 15 h and then subjected to Western blotting with β-catenin antibody. E, cell extracts were prepared from PC3 cell treated with either vehicle (DMSO) or indicated concentrations of decursinol for Western blotting with anti-cyclin D1 antibody. F, PC3 cells were incubated with increasing amounts of decursinol, and cell viability was determined by CellTiter-Glo assay (Promega). The results shown are the average of three experiments, and the bars indicate standard deviations. *, P < 0.05 compared with the vehicle control group. In C, D, and E, the blots were reprobed with anti-actin antibody to confirm equal loading. Decursinol, which contains a pyranocoumarin core without the (CH3)2–C=CH–COO–side chain of decursin (Fig. 6A), is one of the most prevalent compounds in the roots of Korean A. gigas (Yim et al., 2005). It was suggested previously that the side chain of decursin mediates its anticancer activity against hormone-refractory DU145 prostate cancer cells (Yim et al., 2005), and the side chain of decursin was shown to confer anti-AR activity in LNCaP prostate cancer cells (Guo et al., 2007). In this study, decursinol lacked the properties of decursin; it had no effect on Wnt3aCM-induced CRT, the intracellular β-catenin level, or the expression of β-catenin-dependent genes in HEK293 reporter and PC3 cells. It is interesting that decursin had a strong antiproliferative effect on PC3 cells, whereas decursinol did not (Figs. 5E and 6F). The different effects of these compounds on the proliferation of PC3 cells is in accord with their opposing effects on the Wnt/β-catenin pathway, suggesting that inhibition of the Wnt/β-catenin pathway is a central regulatory mechanism of decursin-mediated inhibition of PC3 cell proliferation. In conclusion, we investigated the anticancer effect of decursin on androgen-independent prostate cancer cells using cell-based screening. 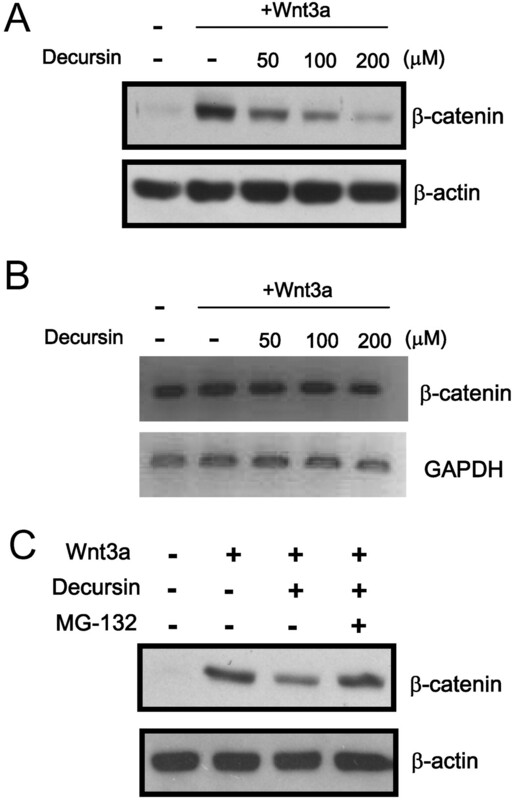 Decursin suppressed the Wnt/β-catenin pathway by promoting the degradation of β-catenin. We also found that the (CH3)2–C=CH–COO–side chain of decursin is crucial for its function, including inhibition of the Wnt/β-catenin pathway and cellular proliferation. Taken together, our findings may facilitate the development of new antineoplastic therapeutics for prostate cancer. We thank M. Davis for dominant-negative β-TrCP expression plasmid. We also thank D.-I. Kang for comments on the manuscripts. This work was supported by the Korea Science and Engineering Foundation grant funded by the Korea government (Ministry of Science and Technology) (R01-2006-000-10617-0) and Regional Innovation Center grants from Traditional and Bio-Medical Research Center, Daejeon University (RRC-04722, 2006) by Industrial Technology Evaluation and Planning (ITEP). ABBREVIATIONS: Fz, Frizzled; CRT, β-catenin response transcription; APC, adenomatous polyposis coli; GSK-3β, glycogen synthase kinase-3β; CM, conditioned medium; β-TrCP, β-transducin repeat-containing protein; HEK, human embryonic kidney; hFz-1, human Frizzled-1; RT-PCR, reverse transcription-polymerase chain reaction; DMSO, dimethyl sulfoxide; MG-132, N-benzyoloxycarbonyl (Z)-Leu-Leu-leucinal; TCF, T-cell factor; AR, androgen receptor. Aberle H, Bauer A, Stappert J, Kispert A, and Kemler R (1997) β-catenin is a target for the ubiquitin-proteasome pathway. EMBO J 16: 3797-3804. Barker N and Clevers H (2000) Catenins, Wnt signaling and cancer. Bioassays 22: 961-965. Chesire DR, Ewing CM, Gage WR, and Issac WB (2000) Detection and analysis of β-catenin mutation in prostate cancer. Prostate 45: 323-334. Chesire DR and Issac WB (2002) Ligand-dependent inhibition of β-catenin/TCF signaling by androgen receptor. Oncogene 21: 8453-8469. Chi HJ and Kim HS (1970) Studies on the components of Umbelliferae plants in Korea: pharmacological study of decursin, decursinol and nodakenin. Korean J Pharmacol 1: 25-32. Cho M, Gwak J, Park S, Won J, Kim DE, Yea SS, Cha IJ, Kim TK, Shin JG, and Oh S (2005) Diclofenac attenuates Wnt/β-catenin signaling in colon cancer cells by activation of NF-κB. FEBS Lett 579: 4213-4218.
de la Taille A, Rubin MA, Chen MW, Vacherot F, Burchardt M, Buttyan R, and Chopin D (2003) β-catenin-related anomalies in apoptosis-resistant and hormone-refractory prostate cancer cells. Clin Cancer Res 9: 1801-1807. Dignam JD, Lebovitz RM, and Roeder RG (1983) Accurate transcription initiation by RNA polymerase II in a soluble extract from isolated mammalian nuclei. Nucleic Acids Res 11: 1475-1489. Gerstein AV, Almeida TA, Zhao G, Chess E, Buhler K, Pienta K, Rubin MA, Vessella R, and Papadopoulos N (2002) APC/CTNNB1 (β-catenin) pathway alterations in human prostate cancers. Genes Chromosomes Cancer 34: 9-16. Giles RH, van Es JH, and Clevers H (2003) Caught up in a Wnt storm: Wnt signaling in cancer. Biochim Biophys Acta 1653: 1-24. Guo J, Jiang C, Wang Z, Lee HJ, Hu H, Malewicz B, Lee HJ, Lee JH, Baek NI, Jeong JH, et al. (2007) A novel class of pyranocoumarin anti-androgen receptor signaling compounds. Mol Cancer Ther 6: 907-917. Gwak J, Cho M, Gong SJ, Won J, Kim DE, Kim EY, Lee SS, Kim M, Kim TK, Shin JG, et al. (2006) Protein-kinase-C-mediated beta-catenin phosphorylation negatively regulates the Wnt/β-catenin pathway. J Cell Sci 119: 4702-4709. Hart M, Concordet JP, Lassot I, Albert I, del los Santos R, Durand H, Perret C, Rubinfeld B, Margottin F, Benarous R, et al. (1999) The F-box protein β-TrCP associates with phosphorylated β-catenin and regulates its activity in the cell. Curr Biol 9: 207-210. Hart MJ, del los Santos R, Albert IN, Rubinfeld B, and Polakis P (1998) Downregulation of β-catenin by human Axin and its association with the APC tumor suppressor, β-catenin and GSK3β. Curr Biol 8: 573-581. He TC, Sparks AB, Rago C, Hermeking H, Zawel L, da Costa LT, Morin PJ, Vogelstein B, and Kinzler KW (1998) Identification of c-MYC as a target of the APC pathway. Science 281: 1509-1512. Horvath LG, Lelliott JE, Kench JG, Lee DS, Williams ED, Saunders DN, Grygiel JJ, Sutherland RL, and Henshall SM (2007) Secreted Frizzled-related protein 4 inhibits proliferation and metastatic potential in prostate cancer. Prostate 67: 1081-1090. Jemal A, Murray T, Ward E, Samuels A, Tiwari RC, Ghafoor A, Feuer EJ, and Thun MJ (2005) Cancer statistics, 2005. CA Cancer J Clin 55: 10-30. Jiang C, Lee HJ, Li GX, Guo J, Malewicz B, Zhao Y, Lee EO, Lee HJ, Lee JH, Kim MS, et al. (2006) Potent antiandrogen and androgen receptor activities of an Angelica gigas-containing herbal formulation: identification of decursin as a novel and active compound with implications fro prevention and treatment of prostate cancer. Cancer Res 66: 453-463. Kim HH, Ahn KS, Han H, Choung SY, Choi SY, and Kim IH (2005) Decursin and PDBu: two PKC activators distinctively acting in the megakaryocytic differentiation of K562 human erythroleukemia cells. Leuk Res 29: 1407-1413. Klein PS and Melton DA (1996) A molecular mechanism for the effect of lithium on development. Proc Natl Acad Sci U S A 93: 8455-8459. Kuhl M, Sheldahl LC, Park M, Miller JR, and Moon RT (2000) The Wnt/Ca2+ pathway: a new vertebrate Wnt signaling pathway takes shape. Trends Genet 16: 279-283. Latres E, Chiaur DS, and Pagano M (1999) The human F box protein β-Trcp associates with the Cul1/Skp1 complex and regulates the stability of β-catenin. Oncogene 18: 849-854. Lee E, Salic A, Kruger R, Heinrich R, and Kirschner MW (2003a) The roles of APC and Axin derived from experimental and theoretical analysis of the Wnt pathway [published erratum appears in PLoS Biol 2:E89, 2004]. PLoS Biol 1: E10. Lee JH, Choi YS, Kim JH, Jeong HG, Kim DH, Yun MY, Kim EK, and Song GY (2006) A mass preparation method of (+)-decursinol from the roots of Angelica gigas. Yakhak Hoechi 50: 338-344. Lee S, Lee YS, Jung SH, Shin KH, Kim BK, and Kang SS (2003b) Antitumor activity of decursinol angulated and decursin from Angelica gigas. Arch Pharmacol Res 26: 727-730. Lim JD, Kim IH, Kim HH, Ahn KS, and Han HG (2001) Enantioselective synthesis of decursinol angelate and decursin. Tetrahedron Lett 43: 4001. Liu C, Li Y, Semenov M, Han C, Baeg GH, Tan Y, Zhang Z, Lin X, and He X (2002) Control of β-catenin phosphorylation/degradation by a dual-kinase mechanism. Cell 108: 837-847. Liu J, Stevens J, Rote CA, Yost HJ, Hu Y, Neufeld KL, White RL, and Matsunami N (2001) Siah-1 mediates a novel β-catenin degradation pathway linking p53 to the adenomatous polyposis coli protein. Mol Cell 7: 927-936. Mulholland DJ, Read JT, Rennie PS, Cox ME, and Nelson CC (2003) Functional localization and competition between the androgen receptor and T-cell factor for nuclear b-catenin: a means for inhibition of the Tcf signaling axis. Oncogene 22: 5602-5613. Park S, Gwak J, Cho M, Song T, Won J, Kim DE, Shin JG, and Oh S (2006) Hexachlorophene inhibits Wnt/β-catenin pathway by promoting Siah-mediated β-catenin degradation. Mol Pharmacol 70: 960-966, 2006. Polakis P (2000) Wnt signaling and cancer. Genes Dev 14: 1837-1851. Sherr CJ (1996) Cancer cell cycle. Science 274: 1672-1677. Takahashi M, Tsunoda T, Seiki M, Nakamura Y, and Furukawa Y (2002) Identification of membrane-type matrix metalloproteinase-1 as a target of the β-catenin/Tcf4 complex in human colorectal cancers. Oncogene 21: 5861-5867. Tetsu O and McCormick F (1999) β-Catenin regulates expression of cyclin D1 in colon carcinoma cells. Nature 398: 422-426. Utsunomiya T, Doki Y, Takemoto H, Shiozaki H, Yano M, Sekimoto M, Tamura S, Yasuda T, Fujiwara Y, and Monden M (2001) Correlation of β-catenin and cyclin D1 expression in colon cancers. Oncology 61: 226-233. Winklbauer R, Medina A, Swain RK, and Steinbeisser H (2001) Frizzled-7 signalling controls tissue separation during Xenopus gastrulation. Nature 413: 856-860. Winston JT, Strack P, Beer-Romero P, Chu CY, Elledge SJ, and Harper JW (1999) The SCFβ-TRCP-ubiquitin ligase complex associates specifically with phosphorylated destruction motifs in IκBα and β-catenin and stimulates IκBα ubiquitination in vitro. Genes Dev 13: 270-283. Wodarz A and Nusse R (1998) Mechanisms of Wnt signaling in development. Annu Rev Cell Dev Biol 14: 59-88. Yim D, Singh RP, Agrwal C, Lee S, Chi H, and Agarwal R (2005) A novel anticancer agent, decursin, induces G1 arrest and apoptosis in human prostate carcinoma cells. Cancer Res 65: 1035-1044. Zi X, Guo Y, Simoneau AR, Hope C, Xie J, Holcombe RF, and Hoang BH (2005) Expression of Frzb/secreted Frizzled-related protein 3, a secreted Wnt antagonist, in human androgen-independent prostate cancer PC-3 cells suppresses tumor growth and cellular invasiveness. Cancer Res 65: 9762-9770.